Marvel’s “Doctor Strange” follows the story of world-famous neurosurgeon Dr. Stephen Strange who, in his quest for healing after a horrific car accident, discovers powerful magic in a mysterious place known as Kamar-Taj—the front line of a battle against unseen dark forces bent on destroying our reality. I wasn’t expecting much when I caught Doctor Strange with a group of Marvel film friends. As I haven’t read any of the comic books related to Doctor Strange, in fact none of the Marvel comic books, I don’t think this new character can surpass the combined prowess of the Avengers in Captain Amercia: Civil War whom I rooted deeply for. (I guess I should compare it with the origin movies instead). I was pretty glad to say I was both right and wrong. All Marvel Studios origin films have common points – they are fun to watch, have entertaining lines, eye-candy characters (once-in-a-while), and easy to understand. Doctor Strange had ticks on the above points and a little more. I was right that the plot was pretty simple and straight forward – a magical version of Iron Man. A neurosurgeon with an ego as huge as Tony Stark lost control of his hands during a freak accident and went all out to find ways to find solution in Kathmandu in Nepal. The Time Traveler’s Wife and The Notebook female lead Rachel McAdams was the love interest, Christine Palmer who pretty much became the Pepper Potts in his life and assisted him curing magic-inflicted injuries. The characters were likeable, and it was difficult for one to dislike the protagonists, regardless of how flawed they were. With a simple success-guaranteed plot formulae, Doctor Strange managed to up the game with 1 thing – great visual effects. I’m not a fan of IMAX 3D, but if there’s any film you should definitely watched on IMAX 3D and watch it twice (if you can), it will definitely be Doctor Strange. The opening fight sequence made use of visual tricks which will blow your mind (especially if you have never watched Inception). The way they found in mirrored world so that it doesn’t affect the real world reminded me of Kamen Rider Ryuki, the multi-dimensional fights and gravity defying fights were pretty astounding. I was so amazed by the fast-paced works and flawless visuals that I couldn’t help but wish for another go to see if I’ve missed out anything. Best of all, (in the final act) the film did not make newbie sorcerer Doctor Strange defeat the ultimate villain with his magical powers. He used wit and intelligence over violence, unlike some Fe people ahem. Aside from the amazing visuals, the realistic + cringeworthy post-accident wounds Doctor Strange had on fingers were disgustingly impressive. They were bloodier and more realistic than Iron Man’s missing heart. The closeup effects of possessed Kaecilius (Mads Mikkelsen) eyes gave me goosebumps too. The 115-minute film (and 2 mid-credit/post credit scenes) is definitely worth holding your bladder for. Before becoming the Sorcerer Supreme, Stephen Strange received training at an Eastern monastery. Benedict Cumberbatch spent his gap year volunteering as an English teacher at a Buddhist monastery in Darjeeling, India. He embarked on a strict training regimen by hitting the gym with the use of a personal trainer to beef up for the role. Cumberbatch would drink protein shakes and eat double the amount of calories. Benedict Cumberbatch was the first choice and was offered the lead role of Stephen Strange but initially had to decline due to his theatre commitments playing Shakespeare’s Hamlet which will clash with the film’s proposed shooting date. When the release date was pushed back from July 2016 to November 2016, he was able to commit to shooting. -Thor (2011): The Orb of Agamotto can be seen among the treasures in Odin’s treasure chamber. -Thor: The Dark World (2013): The Crossroads is among the various phrases written on Selvig’s chalkboard. The Crossroads is an other-dimensional reality that has a prominent role in the “Doctor Strange” comics. -Captain America: The Winter Soldier (2014): Jasper Sitwell mentions Stephen Strange as one of the high-risk targets that HYDRA keeps under surveillance. In the comics, the Ancient One is an old man; in this film, the Ancient One is played by a woman. This was a deliberate decision as Scott Derrickson felt the Ancient One was a title rather than a person. The casting of Tilda Swinton as The Ancient One was particularly controversial and drew accusations of whitewashing as the character is portrayed as a Tibetan man in the source material. Director Scott Derrickson is a big fan of Doctor Strange, and spent his own money on a concept video he pitched to Marvel so that he could get the job of directing the film. He had written a 12-page scene for the movie, illustrated with his own concept art alongside storyboards from professional artists, which he presented in a 90 minute pitch to the studio. This cost Derrickson an “obnoxious amount” of his own money, but he felt it necessary to prove that he wanted the job more than anyone. After hiring Derrickson, Marvel bought the 12-page scene off him, and it became one of the film’s main set pieces. In designing the Eye of Agamotto, creator of Dr. Strange – Steve Ditko drew inspiration from the real world charm The All Seeing Eye of the Buddha, known among the Buddhists as The Amulet of Snail Martyrs, a Nepali symbol meant to protect its wearer from evil. Stan Lee was man on the bus reading “The Doors Of Perception” by Aldous Huxley. Stan Lee’s cameo in the film was directed by Gunn on the set of Guardians of the Galaxy Vol. 2. This was alongside several other Lee cameos, to limit the amount of travel he had to do for the next four MCU films. Gunn contacted Derrickson during the shoot to ensure that the shot matched up with the respective Doctor Strange scene, and “kept throwing lines at” Lee on the day to give Derrickson and Marvel plenty of options to choose from for the film. Just before having the car accident, Stephen is on the phone discussing potential patients. One patient mention is a US army colonel who was injured testing some experimental armour. This is a reference to James Rhodes, aka War Machine. Check out Marvel’s Doctor Strange Official Website and Facebook Page! 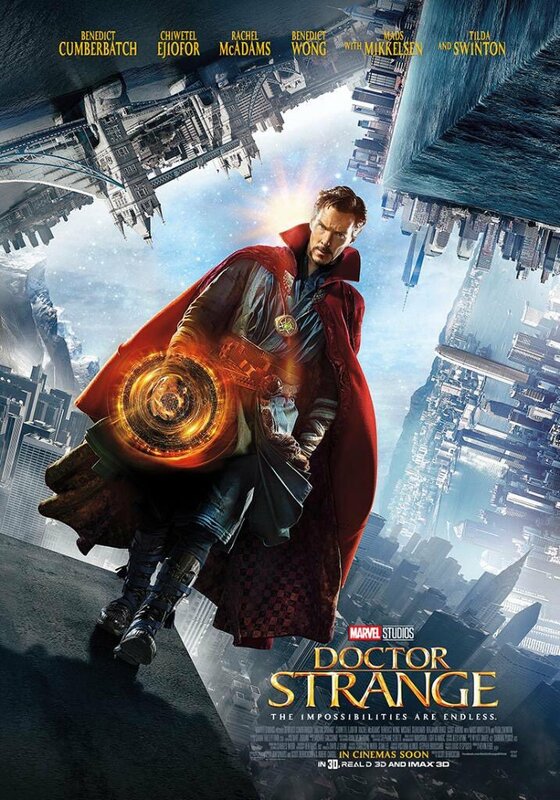 Marvel’s Doctor Strange is out in cinemas on 27 October 2016. This is such a good movie.. I’d like to watch it very very much! Yeah to Marvels doctor strange! This movie is very intriguing. By the title itself, it is really strange. I want to watch this movie, your review is very informative! I watched it and I liked it!! Visuals are simply amazing…The shoot in Nepal looks very real. I enjoyed this film very much even if I did not know the comics at all. Very interesting to know that Joaquin Phoenix was considered for this role, since Cumberbatch looked just right for it. Maybe he Joaquin could be a better Luthor though. I’ve been looking forward to watching Dr. Strange. I haven’t followed much of the comics story line but this would really leave a lot of room for surprises on my part. I shouldn’t let this movie pass. My friends all say it’s really good. I wonder how Doctor Strange uses his magical powers through intelligence only. The actors trained super hard for this for sure. Not a very big fan of the whole Avengers or any Super hero movies. Never bothered to watch Superman, Batman or Captain America. May skip this too!!! I’ve really heard about good things in this movie and I’m also a big fan of a movie like this. With this written movie of yours, I am more interested to see this in Imax. AAnother great movie review from you. Benedict Cumberbatch can act so I know that this movie would be good. The visual effects are stunning. I do not like when Asian characters are played by Western actors. It is not right. However, we are not the ones who can make the decision. We can only hope that this trend would change in the future.